Continuous Learning is The Only way to Success and there is no shortcut to it. You will have to give it some time if you want be a professional .This course is specially designed for those who have no prior knowledge of computer programming and new in this field . This course will take you through in-depth concept and knowledge about C++ programming . 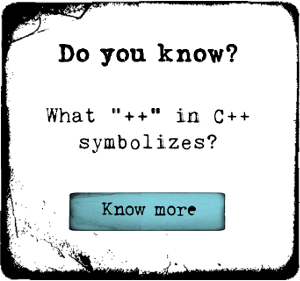 The more important thing is ,its not any shortcut for learning C++ . You will notice one main difference between this course and others as it will provide you knowledge by developing your skills and logic . Lectures are designed by considering mental aptitude of beginners students of all age and classes . So if you really want to give your self a challenging and meaningful environment then buy this course .